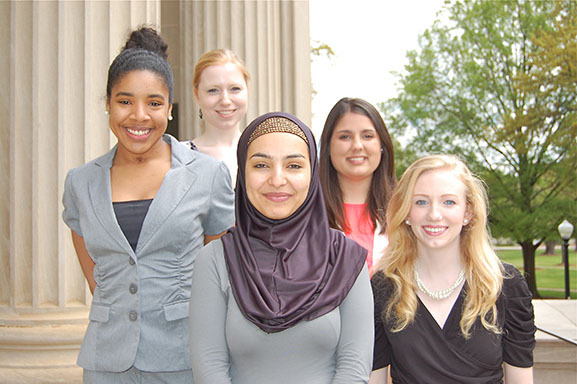 College of Arts and Sciences undergraduates Ashley Smith (second from left), Hailah Saeed (center), and Grace Spears (right), earned UA Study Away scholarships to continue their studies this summer. They are pictured with two other UA students Kimiko Clayton and Melanie Woodward, who also earned scholarships. From the May 2013 Desktop News | Three students in the College will continue their studies outside of UA this summer with the help of UA Away scholarships, an initiative that supports student study away opportunities and promotes a commitment to global citizenship. Two additional UA students were awarded scholarships, which are sponsored by UA’s Division of Student Affairs. Hailah Saeed, a senior criminal justice major from Coldwater, Mich., will be interning in Washington, D.C. in the public and non-profit areas of international affairs. She will work at the Institute for International Education with a recruitment program for international law students. Her work will involve educating law students from the Middle East about the judicial branch of the U.S. government. The aim of the program is for participants to try to implement some of these principles in their home countries. Saeed’s ability to speak Arabic is one factor that will assist her in her work. She also plans to volunteer with the Center for Global Understanding, an outreach organization for American Muslim youth. After her UA Study Away experiences this summer, Saeed hopes to pursue graduate studies and eventually return to Washington, D.C. to work in a similar capacity. Although she has traveled to Europe once before, Spears said this will be the first time she will be there on her own. She said she hopes she will gain a sense of independence while studying abroad, a skill that will ultimately benefit her as she pursues her pre-medical studies when she returns to UA this fall. Ashley Smith, a junior studying dance and apparel design, will study language and culture at the Scuola Leonardo da Vinci in Florence, Italy. Smith, who is from South Riding, Va., has taken two years of Italian and is excited to expand her language skills with this opportunity. In addition to learning the Italian language, Smith will be going on a number of cultural visits to museums and places of interest throughout the country during her six-week stay. Having traveled to both London and Portugal before, Smith said she is excited to go to Italy where the connections to both fashion and dance are strong. “I really love traveling, it has helped me to expand my perspective,” she said.